The kitchen is one of the most dangerous rooms in a household, as cooking appliances are one of the most likely causes of accidental house fires. To detect a fire in a kitchen, heat alarms are usually installed. The kitchen, h owever, also contains a less well-known risk, carbon monoxide (or CO). Gas boilers are often located in the kitchen, alongside gas cookers and ovens, creating potential sources of carbon monoxide, this poisonous gas is a by-product of fossil fuels such as gas being burned. As this gas cannot be seen, smelled or tasted, a carbon monoxide alarm is the only way of detecting it, giving a loud warning sound if CO is detected. Ei Electronics has now launched an excellent solution; a detector that deals with both risks in one unit. 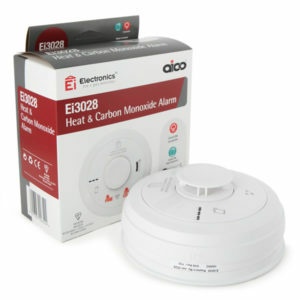 The Ei3028 combined heat and carbon monoxide detector can detects both of these potential dangers, warning occupants in the event of a fire or a CO leak in the kitchen. Instead of having to install two separate alarms (a CO and a heat alarm), with the associated costs of an electrician and wiring, just one alarm needs to be installed. This gives a cost saving and also is more aesthetically pleasing as there is only one alarm on your ceiling. This unique combined mains powered heat and CO alarm is fitted with a 10 year rechargeable lithium back-up battery, so will never require the replacement of batteries during its 10 year life. It features two different alarm sounds depending on which sensor has been triggered. The Ei3028 alarm is part of a product family that covers all the risks in your house or flat. The range includes smoke, heat, carbon monoxide and combined smoke and heat detectors, all of which are compatible with previous models of Ei ranges. The SmartLINK module is also available which allows for hybrid interlinking (radio or hardwired) of up to 12 compatible devices. 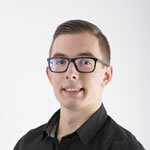 Connor is one of our product administrators. He has a wealth of knowledge when it comes to smoke alarms, and fire extinguisher products. What are Generations and do They Matter for Nest Products? It is well known that computer-based technology advances very quickly, with products being outdated and replaced by a newer version, or ‘generation,’ almost every year. Nest Labs’ range of ‘smart home’ products is no exception to this as the oldest two have already undergone a few iterations of redesign and improvement. Safelincs has a close relationship with Nest in the UK and gets its stock directly from them, so you can be assured that you’re buying the latest models. However, if you already own Nest products that may be older models you have nothing to worry about as there is no issue mixing new and old generations of Nest devices in your home. 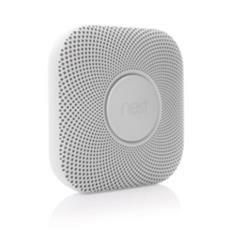 The Nest Protect combines an industrial-grade smoke detector and carbon monoxide detector with voice alerts, status and testing via a smartphone app, and a range of extra features like a motion-sensing nightlight. With the second generation, you can even hush false alarms from the app. The 2nd generation Nest Protect has been redesigned with a more curved and smooth profile, a clear difference from the 1st gen’s mostly square form. However, the new design isn’t just a prettier face; it has become an even more formidable guardian for your home as it is the first domestic smoke alarm to sport a ‘split-spectrum’ smoke sensor. Utilising two frequencies of light, it can more accurately detect finer particles released by fast-flaming fires. 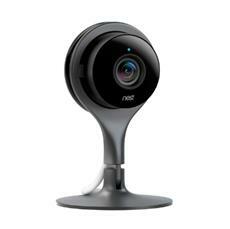 The new Nest Protect also has a special wire mesh to decrease false alarms caused by dust or bugs. Furthermore, by changing the materials and components used in manufacturing, the 2nd gen Protect has a lifespan of 10 years compared to the 1st generation’s 7 years. While the new Nest Learning Thermostat is a little slimmer than gen 2, the most noticeable difference is the much larger screen – 8.25cm vs 7cm – and they haven’t forgotten to increase the resolution to take advantage of this upgrade. Nest has also replaced the proximity sensor in the latest model which enables the thermostat to detect you across the room and wake up the screen, showing you the current time or temperature. Some more functional updates in the 3rd generation involved not only upgrading the integrated WiFi chip, to support 5GHz for futureproofing against newer routers and to reduce dropped connections, but Nest also added support for OpenTherm. 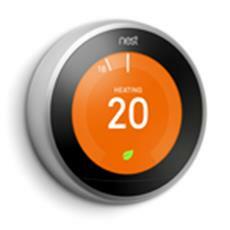 If your boiler supports this technology, the Nest Learning Thermostat can now help you manage your hot water as well as central heating. If you do not recognise your Nest thermostat here, please visit https://nest.com/support/article/How-can-I-tell-which-Nest-Learning-Thermostat-I-have. You may have an older generation thermostat which was not made for compatibility with European systems. The Nest Cam comes in two versions, Indoor and Outdoor, though both are on their first iteration so no matter where you see them or how long you’ve had one, it’s still the latest model. The black Indoor model is almost shaped like an inverted raindrop and has a noticeably slimmer and sleeker profile compared to its weatherproof brother, which appears more like a white coffee cup with no handle. Regardless of which model you purchase you’ll get a bunch of great features like snapshots of activity over the last 3-hours, optional subscriptions for 10- or 30-day full video history, the ability to view live video from anywhere over the Internet, and 2-way voice communications between the Nest app and your Nest Cam. The only functional differences between the two are their mounting options and that the Outdoor model’s components are weatherproof. To summarise, while Nest’s offerings have gone through a varying number of upgrades you can rest assured that, as long as you don’t accidentally purchase a first generation Learning Thermostat, all of your Nest gadgets will work together seamlessly. If you really want to have the latest models, though, Safelincs has you covered. For any questions or to place an order you can call us on 0800 978 8202 or email support@safelincs.co.uk. Safelincs has installed several hundred P50 service-free extinguishers at Bournemouth University’s campus in Poole. The new appliances replace units that required annual servicing by an external maintenance company. P50s are corrosion-proof and do not require maintenance by an extinguisher engineer or a discharge test over their entire 10 year lifespan. Instead, they only require an annual visual inspection which can be carried out by the university’s staff. After 10 years the extinguishers can be factory-refurbished for another decade of service-free life. (At the end of their life they are recyclable). Manufactured in the UK, the extinguishers are Kitemarked by BSI to EN3. Included in the purchase price of the extinguishers is a site survey, the installation and certification of the P50s and a concise training session for the staff members that will be carrying out the annual visual inspection. Brackets and signage are, of course, also included. 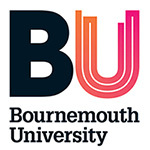 “Whilst the P50s are more expensive than standard extinguishers, significant savings will be made due to us not having to bring in external engineers,” explained Rick White, Maintenance Services Manager at Bournemouth University. If your organisation would like to benefit from this cost saving solution, please contact Safelincs on 0800 612 6537 or email support@safelincs.co.uk and we will advise you about the best solution for your organisation. As summer finally seems to be upon us, Fire Kills, the Government department dedicated to improving fire safety, has made ‘Outdoor Fire Safety’ the theme for June. As an official Fire Kills sponsor, Safelincs is helping to spread the message. Safety initiatives over the years have meant that actual fires caused by barbecues are uncommon. However, according to the Royal Society for the Prevention of Accidents (RoSPA), almost 2,000 people attend A&E units each year having had an accident involving a barbecue. Some of the accidents lead to very serious burns, usually as a result of using an accelerant such as petrol to light the fuel. The number of accidents usually increases if we have a hot summer. • Don’t drink too much alcohol if in charge of the barbecue (or any cooking!). • Make sure the barbecue is well away from sheds, fences, trees, shrubs or garden waste. • Never leave a barbecue or any cooking unattended. • Keep a bucket of water, sand or the garden hose nearby for emergencies. • Follow the safety instructions provided with disposable barbecues. • Never use petrol or paraffin to start or revive a barbecue; use only recognised lighters or starter fuels on coal. • Empty ashes onto bare garden soil, not into dustbins or wheelie bins. If they’re hot, they can melt the plastic and start a fire. • Never use candles in or near a tent – torches are safer. • Don’t smoke inside a tent. • Set up tents at least six metres apart and away from parked cars. • Keep cooking area clear of items that catch fire easily, including long, dry grass and in a place where they can’t easily be knocked over. • Keep matches, lighters, flammable liquids and gas cylinders out of the reach of children. • Have an escape plan and be prepared to cut your way out of your tent if there is a fire. IT SHOULD BE PARTICULARLY STRESSED THAT BARBECUES SHOULD NEVER BE BROUGHT INSIDE A TENT. THEY EMIT DEADLY CARBON DIOXIDE FUMES (EVEN MORE WHEN THEY ARE COOLING DOWN). FATALITIES HAVE OCCURRED IN THE PAST. • Maintaining a boat’s fuel, gas and electrical systems on a regular basis. • Setting up an emergency plan with everyone on board before setting out. • Ensure caravans and tents are at least six metres apart and away from parked cars. • If smoking, use metal ashtrays – and never smoke in bed. • Don’t leave children alone inside. • Turn off all appliances before leaving the caravan or going to bed. • Never use a cooker or heater whilst the caravan is moving. Every year, fire destroys thousands of acres of countryside and wildlife habitats. Some fires are started deliberately, but most are due to carelessness. Dry ground in the summer means there’s an added risk of a fire starting. A few simple precautions will help reduce incidents. • Extinguish cigarettes properly and never throw cigarette ends out of car windows. • Avoid using open fires in the countryside. 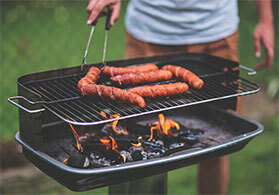 • Only use barbecues in a suitable and safe area and never leave them unattended. • If a fire is spotted in the countryside, report it to the fire and rescue service immediately. • Don’t attempt to tackle fires that can’t be put out with a bucket of water – leave the area as quickly as possible. Safelincs wishes its customers a happy and safe summer! Do you fully understand your responsibilities when it comes to the provision of evacuation devices? If the answer is no, Safelincs can offer you guidance, explaining the legislation linked to evacuation devices, and highlighting the products available to help you meet your legal responsibilities. Are you confident you have covered every eventuality when it comes to your evacuation plan? Evacuation planning must account for all possible scenarios. Failure to identify and eliminate any weaknesses in your plan is likely to be judged as a criminal offence if a fire were to trap a person that would have escaped if appropriate devices had been provided. To learn more about your responsibilities as a business owner or manager, make sure you read our comprehensive guide which distils everything you need to know into a single article. Safelincs are committed to raising awareness of potential evacuation issues, and are on hand if you have any further questions regarding evacuation devices. We are also currently offering a substantial discount on our bestselling evacuation device to support this campaign. If you would like to take advantage of our special offers on leading products, or require further information about any of our products, feel free to contact us via support@safelincs.co.uk, or on 0800 612 6537. Just a month after it purchased a P50 service free fire extinguisher from Safelincs, Abbey Metal Recycling called it into action. Late one afternoon at the end of April, a member of staff was cutting a sub-frame with a disc cutter. A spark ignited a pool of oil on the surface of water inside a gully pot which drains into an inceptor tank. Within seconds a small fire broke out, but it was quickly extinguished using the powder P50. 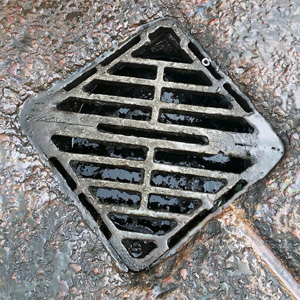 There was no damage to the gully pot or drain gate and nobody was injured. Abbey Metal Recycling is a family owned and operated metal recycler based in Cinderford in Gloucestershire. With over forty years’ experience in the metal recycling business, it has earned a strong reputation within the industry for its dependable service. 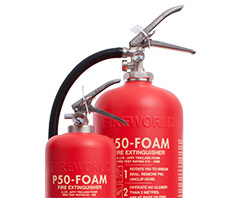 The company purchased the P50 as it is an appliance which, due to the nature of its manufacture, requires only an annual check by a member of its own staff rather than a costly yearly visit from an external extinguisher engineer. All the components in the P50’s construction are non-corroding and this, together with a ten year warranty, make it an attractive proposition for the environment in which it is utilised by a recycling company. Furthermore, Abbey Metal Recycling benefited from Safelincs’ free replacement / repair policy for all fire safety items sold by Safelincs which are utilised or damaged in a fire situation. Abbey’s P50 was therefore immediately replaced free of charge. The Dorgard fire door retainer has traditionally been suitable for use on wooden doors only. The fixing screws supplied with the Dorgard did not allow for installation on steel doors – an application growing in popularity. With the increase in steel door installations, it was evident that an adapter was needed to cater for this requirement. Working with Fireco, the manufacturers, Safelincs now offer the new self-adhesive adapter plate, which allows for the Dorgard fire door retainer to be installed on a steel door. The adapter is fitted quickly and easily and the Dorgard can be removed for maintenance purposes from the plate even after the install. The adapter plate is supplied with a chemical cleaning cloth to prepare the door’s surface and clear instructions for the installation. Using the Dorgard fitting template as a guide, this allows for the installer to mark out the necessary position of the plate. Once marked, the plate can be secured to the steel door using the self adhesive sticker pads. The Dorgard can then be fixed to the adapter plate using the fixing screws provided. The adapter plate for steel doors can also be used with the wood effect Dorgard fire door retainers, as well as the metal cover finishes. It is a British Standard requirement that fire extinguishers are either wall hung or placed on a stand. This is to ensure that fire extinguishers are kept in the correct location and to deter unauthorized movement. There are two main types of brackets to suit most fire extinguishers; Lug and J brackets. 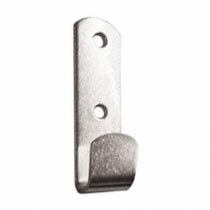 Lug brackets are specifically designed for CO2 fire extinguishers. They are shaped similarly to a letter “L” with a slight lip for the extinguisher to hook on to. Usually, portable CO2 fire extinguishers are available in 2kg and 5kg sizes, of which the lug bracket for the 5kg CO2 fire extinguisher tends to be larger than the bracket for the 2kg CO2 fire extinguisher. 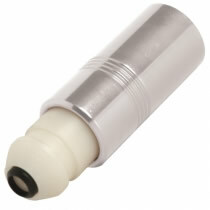 This is to accommodate the difference in cylinder size. We also offer aluminium and plastic wall brackets for anti-magnetic CO2 fire extinguishers used near sensitive scanning equipment in hospitals. 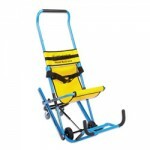 J brackets are suitable for most makes of powder, water and foam fire extinguishers. Units are hooked on to the J bracket by a loop that is typically found on the back of the extinguisher cylinder. 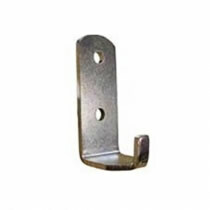 Both Lug and J brackets are available in our extinguisher bracket section and are sold in packs of 20. In our short series of introductions to fire extinguisher servicing tools we are featuring the fire extinguisher pump gauge tester which is used by engineers to make sure that the pressure gauge of stored pressure fire extinguishers is operating correctly and is not stuck. In normal operation the needle of the gauge is held in place by the pressure behind the gauge. When the pressure is adjusted e.g. the extinguisher is discharged, the needle moves accordingly. The gauge tester is needed by engineers to make sure that the needle is free-moving and has not seized up over time. The test is carried out by removing a small sticker located on the extinguisher gauge covering a small hole. if the hole does not exist yet, a small hole is drilled by the engineer. The pump is placed over the hole and actioned. This changes the pressure in the gauge housing and the needle moves. If the needle does not move, the gauge has seized up and must be changed. At the end of a test a new sticker is placed over the hole. The colour of the sticker indicates the year of the test.